Relax and enjoy the morning soaking up the warm rays of the Mediterranean sun. 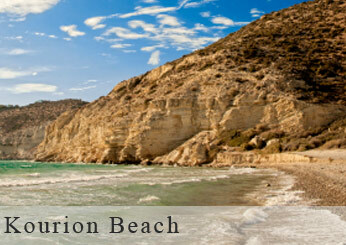 A long stretch of white sand below the hill of ancient Kourion is the ideal destination for swimming and sunbathing. Truly rural countryside, cultivated fields and plantations, the sounds of crickets and frogs from the nearby fields interrupting the peaceful ambience of the surroundings with the occasional hand glider soaring overhead above the cliffs of Kourion hill. A truly appealing and unspoilt beach for relaxation. Tour suitable for elderly persons and with limited walking capabilities. There are few restaurants on the beach but their operation depends on the time of the year.